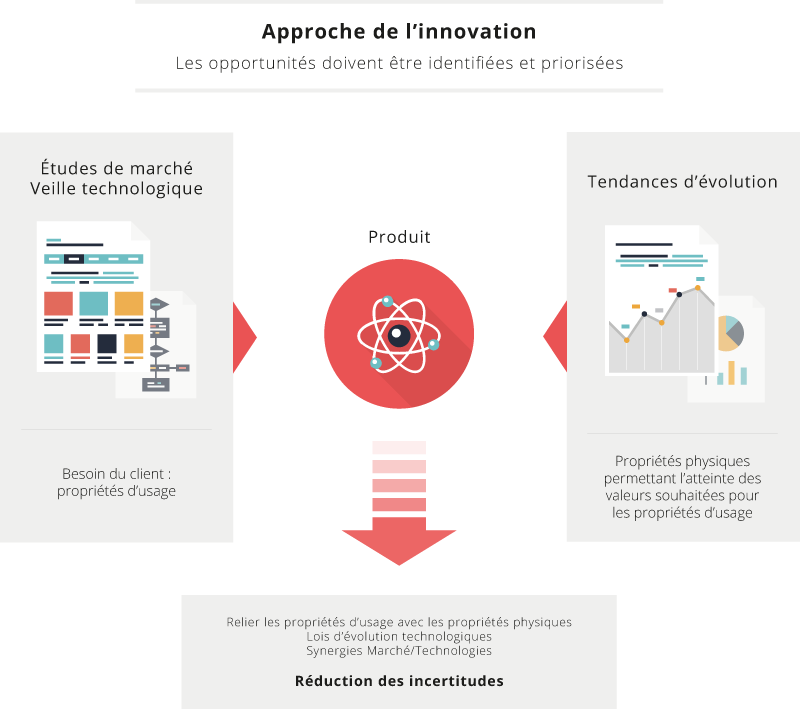 Innovation’s strategy | MeetSYS - Cabinet d'expertise sur l'application de la théorie TRIZ pour conduire l'innovation. Our principle is that company’s actors are the most relevant ones to decide their products’ evolution… as ideas are already in their minds! The only problem is to synthetize them and to manage uncertainties..
Our analytical approach, based on an algorithm referring to evolution’s laws and TRIZ theory’s tools, harnesses the capacity of your team to focus on strategic reflections, taking advantage of their multiple sensitivities (marketing, commercial, research, industrialization), structuring and prioritising the ideas, identifying innovative ones and obtaining their full support to proposed priorities and solutions. Our experts will help you collect the “good ideas” to be managed in order to reach any breakthrough or step-by-step innovation. A successful technical innovation is characterized by the optimisation of the couple performance/cost. It becomes necessary to connect the customers’ need(s) to the physics of the studied system by identifying the “key parameters” which meet both users’ needs and technological possibilities. By this way, innovation is considered as a scientific study of technological parameters on which can be applied the evolution’s laws and problems’ resolution corresponds to match innovation’s parameters values and market’s needs. This approach reduces drastically uncertainties, minimizes the design of experiments and the “time to market”. The method reconciles the properties linked to customers’ use with the physical parameters linked to product’s technology. Locate the company results on the S-curves and the volumes/sales graphics. Estimate the most probable values reachable by the physical parameters of the technical system (systemic approach).